A paddle steamer is a steamship or riverboat powered by a steam engine that drives paddle wheels to propel the craft through the water. In antiquity, paddle wheelers followed the development of poles, oars and sails, where the first uses were wheelers driven by animals or humans. Left: Riveted steel paddle wheel from a sidewheeler paddle steamer on the lake of Lucerne. Right: detail of a steamer. The paddle wheel is a large steel framework wheel. The outer edge of the wheel is fitted with numerous, regularly-spaced paddle blades (called floats or buckets). The bottom quarter or so of the wheel travels underwater. An engine rotates the paddle wheel in the water to produce thrust, forward or backward as required. More advanced paddle wheel designs feature feathering methods that keep each paddle blade closer to vertical while in the water to increase efficiency. The upper part of a paddle wheel is normally enclosed in a paddlebox to minimise splashing. There are two types of paddle wheel steamer, a sternwheeler with a single wheel on the rear, and a sidewheeler with one on each side. Both were used as riverboats in the United States. Some still operate for tourists, for example on the Mississippi River. Although the first sternwheelers were invented in Europe, they saw the most service in North America, especially on the Mississippi River. Enterprise was built at Brownsville, Pennsylvania, in 1814 as an improvement over the less efficient side wheelers. The second sternwheeler built, Washington of 1816, had two decks and served as the prototype for all subsequent steamboats of the Mississippi, including those made famous in Mark Twain's book Life on the Mississippi. Sidewheelers are used as riverboats and as coastal craft. Though the side wheels and enclosing sponsons make them wider than sternwheelers, they may be more maneuverable, since they can sometimes move the paddles at different speeds, and even in opposite directions. This extra maneuverability makes sidewheelers popular on the narrower, winding rivers of the Murray-Darling system in Australia, where a number still operate. European sidewheelers, such as PS Waverley, connect the wheels with solid drive shafts that limit maneuverability and give the craft a wide turning radius. Some were built with paddle clutches that disengage one or both paddles so they can turn independently. However, wisdom gained from early experience with sidewheelers deemed that they be operated with clutches out, or as solid shaft vessels. Crews noticed that as ships approached the dock, passengers moved to the side of the ship ready to disembark. The shift in weight, added to independent movements of the paddles, could lead to imbalance and potential capsizing. Paddle tugs were frequently operated with clutches in, as the lack of passengers aboard meant that independent paddle movement could be used safely and the added maneuverability exploited to the full. In a simple paddle wheel, where the paddles are fixed around the periphery, power is lost due to churning of the water as the paddles enter and leave the water surface. Ideally, the paddles should remain vertical while under water. This ideal can be approximated by use of levers and linkages connected to a fixed eccentric. The eccentric is fixed slightly forward of the main wheel centre. It is coupled to each paddle via a rod and lever. The geometry is designed such that the paddles are kept almost vertical for the short duration that they are in the water. The Italian physician Guido da Vigevano (c. 1280–1349), planning for a new crusade, made illustrations for a paddle boat that was propelled by manually turned compound cranks. Paddle boat, by the Italian artist-engineer Taccola, De machinis (1449). The paddles wind a rope fixed to an anchor up stream, thus moving the boat against the current. One of the drawings of the Anonymous Author of the Hussite Wars shows a boat with a pair of paddle-wheels at each end turned by men operating compound cranks. The concept was improved by the Italian Roberto Valturio in 1463, who devised a boat with five sets, where the parallel cranks are all joined to a single power source by one connecting-rod, an idea adopted by his compatriot Francesco di Giorgio. In 1704, the French physicist Denis Papin constructed the first ship powered by his steam engine, mechanically linked to paddles. This made him the first to construct a steam-powered boat (or vehicle of any kind). Then he has poured the first steam cylinder of the world in the iron foundry Veckerhagen. In 1787 Patrick Miller of Dalswinton invented a double-hulled boat that was propelled on the Firth of Forth by men working a capstan that drove paddles on each side. Model made by de Jouffroy in 1784 to show the French Science Academy the engine and paddle wheels used on Pyroscaphe. The model is now in the National Maritime Museum in Paris. One of the firsts functioning steamships, Palmipède, which was also the first paddle steamer, was built in France in 1774 by Marquis Claude de Jouffroy and his colleagues. The 13-metre (42 ft 8 in) steamer with rotating paddles sailed on the Doubs River in June and July 1776. In 1783 a new paddle steamer by de Jouffroy, Pyroscaphe, successfully steamed up the river Saône for fifteen minutes before the engine failed. Bureaucracy and the French Revolution thwarted further progress by de Jouffroy. The next successful attempt at a paddle-driven steam ship was by the Scottish engineer William Symington, who suggested steam power to Patrick Miller of Dalswinton. Experimental boats built in 1788 and 1789 worked successfully on Lochmaben Loch. In 1802, Symington built a barge-hauler, Charlotte Dundas, for the Forth and Clyde Canal Company. It successfully hauled two 70-ton barges almost 20 miles (32 km) in 6 hours against a strong headwind on test in 1802. There was much enthusiasm, but some directors of the company were concerned about the banks of the canal being damaged by the wash from a powered vessel, and no more were ordered. While Charlotte Dundas was the first commercial paddle-steamer and steamboat, the first commercial success was possibly Robert Fulton's Clermont in New York, which went into commercial service in 1807 between New York City and Albany. Many other paddle-equipped river boats followed all around the world. 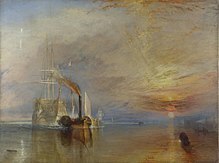 A paddle tug pulling HMS Temeraire to a breaking yard in 1838. In 1812, the first U.S. Mississippi River paddle steamer began operating out of New Orleans. By 1814, Captain Henry Shreve[b] had developed a "steamboat" [c] suitable for local conditions. Landings in New Orleans went from 21 in 1814 to 191 in 1819, and over 1,200 in 1833. The first sternwheeler was built by Mr. Roentgeres at Rotterdam, and used between Antwerp and Ghent in 1827. Team boats, paddle boats driven by horses, were used for ferries the United States from the 1820s–1850s, as they were economical and did not incur licensing costs imposed by the steam navigation monopoly. In the 1850s, they were replaced by steamboats. After the American Civil War, as the expanding railroads took many passengers, the traffic became primarily bulk cargoes. The largest, and one of the last, paddle steamers on the Mississippi was the sternwheeler Sprague. Built in 1901, she pushed coal and petroleum until 1948. "...between 1132 and 1183 (AD) a great number of treadmill-operated paddle-wheel craft, large and small, were built, including sternwheelers and ships with as many as 11 paddle-wheels a side,". The standard Chinese term "wheel ship" was used by the Song period, whereas a litany of colorful terms were used to describe it beforehand. In the 12th century, the Song government used paddle-wheel ships en masse to defeat opposing armies of pirates armed with their own paddle-wheel ships. At the Battle of Caishi in 1161, paddle-wheelers were also used with great success against the Jin Dynasty (1115–1234) navy. The Chinese used the paddle-wheel ship even during the First Opium War (1839–1842) and for transport around the Pearl River during the early 20th century. The first seagoing trip of a paddle steamer was by the Albany in 1808. It steamed from the Hudson River along the coast to the Delaware River. This was purely for the purpose of moving a river-boat to a new market, but paddle-steamers began regular short coastal trips soon after. In 1816 Pierre Andriel, a French businessman, bought in London the 15 hp (11 kW) paddle steamer Margery (later renamed Elise) and made an eventful London-Le Havre-Paris crossing, encountering heavy weather on the way. He later operated his ship as a river packet on the Seine, between Paris and Le Havre. The first paddle-steamer to make a long ocean voyage crossing the Atlantic Ocean was SS Savannah, built in 1819 expressly for this service. Savannah set out for Liverpool on May 22, 1819, sighting Ireland after 23 days at sea. This was the first powered crossing of the Atlantic, although Savannah was built as a sailing ship with a steam auxiliary; she also carried a full rig of sail for when winds were favorable, being unable to complete the voyage under power alone. In 1822, Charles Napier's Aaron Manby, the world's first iron ship, made the first direct steam crossing from London to Paris and the first seagoing voyage by an iron ship. In 1838, Sirius, a fairly small steam packet built for the Cork to London route, became the first vessel to cross the Atlantic under sustained steam power, beating Isambard Kingdom Brunel's much larger Great Western by a day. Great Western, however, was actually built for the transatlantic trade, and so had sufficient coal for the passage; Sirius had to burn furniture and other items after running out of coal. Great Western's more successful crossing began the regular sailing of powered vessels across the Atlantic. Beaver was the first coastal steamship to operate in the Pacific Northwest of North America. Paddle steamers helped open Japan to the Western World in the mid-19th century. The largest paddle-steamer ever built was Brunel's Great Eastern, but it also had screw propulsion and sail rigging. It was 692 ft (211 m) long and weighed 32,000 tons, its paddlewheels being 56 ft (17 m) in diameter. In oceangoing service, paddle steamers became much less useful after the invention of the screw propeller, but they remained in use in coastal service and as river tugboats, thanks to their shallow draught and good maneuverability. The last crossing of the Atlantic by paddle steamer began on September 18, 1969, to conclude six months and nine days later. The steam paddle tug Eppleton Hall was never intended for oceangoing service, but was steamed from Newcastle to San Francisco. As the voyage was intended to be completed under power, the tug was rigged as steam propelled with a sail auxiliary. The transatlantic stage of the voyage was completed exactly 150 years after the voyage of Savannah. Matthew C. Perry's paddle frigate USS Mississippi, part of the Black Ships expedition to Japan (1853–1854). Beginning in the 1820s, the British Royal Navy began building paddle-driven steam frigates and steam sloops. By 1850 these had become obsolete due to the development of the propeller – which was less vulnerable to cannon fire. However, paddle warships were used extensively by the Russian Navy during the Crimean War of 1853–1856, and by the United States Navy during the Mexican War of 1846–1848 and the American Civil War of 1861–1865. With the arrival of ironclad battleships from the late 1850s, the last remaining paddle frigates were decommissioned and sold into merchant-navy service by the 1870s. These included Miami, which became one of the first Boston steamers in 1867. Showboat Branson Belle on Table Rock Lake in Branson, Missouri is a sternwheeler showboat. It is run aground in this picture. A few paddle steamers serve niche tourism needs as cruise boats on lakes[d] and others, such as Delta Queen, still operate on the Mississippi River. In Oregon, several replica paddle steamers, which are non-steam-powered sternwheelers built in the 1980s and later, are operated for tourism purposes on the Columbia and Willamette Rivers. USS Wolverine, built in 1912 as PS Seeandbee, was the biggest passenger-carrying paddle steamer ever built, with a capacity for 6,000 passengers; it was converted to a training aircraft carrier during World War II. PS Washington Irving, also built in 1912 with a capacity for 6,000 passengers, operated on the Hudson River from 1913 until it was sunk in an accident in 1926. One of the last paddle steamers built in the U.S. was the dredge William M. Black, built in 1934 and now a National Historic Landmark. Belle of Louisville is the oldest operating Mississippi River-style steamboat and was named a National Historic Landmark in 1989. Previously named Idlewild and Avalon, Belle of Louisville is based in downtown Louisville, Kentucky. The Shelburne Museum of Vermont features the paddle steamer Ticonderoga, a preserved Lake Champlain ferry, which was transported overland to the museum after being retired from service in 1969, and is now open for tours. The ferries system in Toronto, Ontario, Canada operates PS Trillium, a paddle steamer originally built in 1910 and restored for operation since 1976. It is the last sidewheel-propelled vessel on the Great Lakes. Sister ships Bluebell and Mayflower became garbage scows and the former's hull is now a break wall in Toronto Harbour. The Elbe river Saxon Paddle Steamer Fleet in Dresden (known as "White Fleet"), Germany, is the oldest and biggest in the world, with around 700,000 passengers per year. The 1913-built Goethe was the last paddle steamer on the River Rhine. Previously the world's largest sidewheeler with a two-cylinder steam engine of 700 hp (520 kW), a length of 83 m (272 ft) and a height above water of 9.2 m (30 ft), Goethe was converted to diesel-hydraulic power during the winter of 2008/09. Paddle wheelers are still in operation on some lakes in Southern Bavaria, such as Diessen (49 m, 161 ft) on Ammersee, built in 1908 and converted to a diesel system in 1975. It has been completely rebuilt in 2006. As paddle wheelers have proven to be such a great tourist attraction, a new one was even built in 2002 on Ammersee, Herrsching, but it has never been powered by steam. On lake Chiemsee, RMS Ludwig Fessler (53 m, 174 ft) is still in regular service. It was built in 1926, but is now[when?] also powered by diesel engines (since 1973). The original diesel engine was the last ship engine being built by Maffei (no. 576). This engine has ended up in Switzerland to drive the newly renovated Neuchâtel, launched in 2013. In Austria only a small paddle steamer fleet operates. There is Gisela from 1872 in Gmunden at the Traunsee, Kaiser Franz Josef I. from 1873 in St. Gilgen at the Lake Wolfgang, Hohentwiel from 1913 in Hard (near Bregenz) at the Lake Constance and Schönbrunn from 1912 in Linz at the Danube. In Italy, a small paddle steamer fleet operates on Lake Como and Lake Garda, primarily for tourists. SS Hjejlen has been operation with the same company since she was built in 1861. Sailing passengers to and from Silkeborg and Himmelbjerget ever since, using her original steam engine she was built with. Skibladner is the oldest steamship in regular operation. Built in 1856, she still operates on lake Mjøsa in Norway. Switzerland has a large paddle steamer fleet, most of the "Salon Steamer-type" built by Sulzer in Winterthur or Escher-Wyss in Zurich. There are five active and one inactive on Lake Lucerne, two on Lake Zurich, and one each on Lake Brienz, Lake Thun and Lake Constance. Swiss company CGN operates a number of paddle steamers on Lake Geneva. Their fleet includes three converted to diesel electric power in the 1960s and five retaining steam. One, Montreux, was reconverted in 2000 from diesel to an all-new steam engine. It is the world's first electronically remote-controlled steam engine and has operating costs similar to state-of-the-art diesels, while producing up to 90 percent less air pollution. SS Montreux outside Lutry, Lake Geneva in August 2018. Note: The oldest active Swiss steamship is Greif (1895, on the Greifensee) with screw propulsion. No paddle ship is currently in operation in France as of 2015 (though some Paris sightseeing tourist crafts sport a dummy sternwheel powered by a hydraulic motor). In Lac D'Annecy an almost intact paddle steamer called la France, resting on an even keel, can be visited by advanced divers (resting at 42 metres, 138 ft deep). She was built, like most of its Swiss counterparts by Escher-Wyss in 1909 (as a CKD dismantled kit to be transported by railway and assembled at the local annecy Puya Shipyard) and ran a regular line around Lac d'Annecy. During World War II the ship was laid up in Annecy and used as a prison by the German occupying forces and the Gestapo. La France made her last commercial voyage in 1965 and then fell into neglect and disrepair. Her owner had moored her some distance from the shore to save quay fees and she sprung an ice related leak and sunk in March 1971. It is a popular site among advanced divers (Level 2-assisted or 3-autonomous CMAS is requested to dive the wreck), an almost intact time capsule due to the fresh and low temperature water. Some divers even (mimic to) play underwater French billiard on the intact billiard table in the main lounge. Any hope of raising the ship is vain though: the hull was badly distorted when hitting the rocky lake bottom. PS Waverley, built in 1947, is the last seagoing paddle steamer in the world. This ship sails a full season of cruises from ports around Britain, and sailed across the English Channel to commemorate the sinking of her predecessor of 1899 at the 1940 Battle of Dunkirk. Based at Wareham, PS Monarch (one of the smallest passenger-carrying vessels of her type, with a passenger capacity of only 12) takes trips on the River Frome. Monarch is a side wheeler privately built at Chatham Historic Dockyard. In the River Dart (Devon) PS Kingswear Castle (a coal-fired river paddle steamer) operates short cruises from Dartmouth and trips between Dartmouth and Totnes at high tide. In the USSR, river paddle steamers of the type Iosif Stalin (project 373), later renamed Ryazan-class steamships, were built until 1951. Between 1952 and 1959, ships of this type were built for the Soviet Union by Óbudai Hajógyár Budapest factory in Hungary. In total, 75 type Iosif Stalin/Ryazan sidewheelers were built. They are 70 m (230 ft) long and can carry up to 360 passengers. Few of them still remain in active service. Australia has a large collection of authentic and replica paddle steamers and paddle boats operating along the Murray and Darling Rivers, and in other areas around the country. Echuca/Moama has the largest fleet of paddle steamers in Australia, with 7 of them operating commercially and a large number of smaller privately owned vessels. PS Adelaide is the oldest wooden-hulled paddle steamer in the world. Built in 1866, she operates from the Port of Echuca, on Australia's Murray River, which has the largest fleet of paddle steamers in the world. PS Pevensey built 1911 in Moama and based in Echuca is still working as a tourist attraction on the Murray River. Pevensey also starred as the fictional paddlesteamer Philadelphia in the TV series All the Rivers Run. PS Alexander Arbuthnot built 1923 at Koondrook, named after the former owner of the Arbuthnot Sawmills, works today as a tourist boat at the Port of Echuca. PS Canberra, built 1913 at Goolwa, is currently operating public cruises in Echuca. Canberra was built for the Conner family of Boundary Bend as their flagship fishing vessel, however has been in the tourism industry since 1944. PS Emmylou, a replica steamer was built in 1982 at Barham, and operates a large range of cruises in Echuca – from 1 hour sightseeing trips to 3 night/4 day fully accommodated voyages. She is powered by an authentic steam engine, dating back to 1906. PS Melbourne, built 1912, operates sightseeing cruises from Mildura. PS Murray Princess is the largest of the paddle wheelers operating in Australia, although she is a recent build (1987). Murray Princess measures in around 210 ft (64 m) in length, 45 ft (14 m) in width and has a remarkably shallow draft of 3 ft (0.9 m). It has accommodation for 120 passengers and up to 30 crew and operates 3, 4 & 7 night cruises along the Murray from Mannum in South Australia. Murray Princess was owned and operated for many years by Captain Cook Cruises in Sydney, but has recently been sold to Sealink Travel Group based in Adelaide. The replica paddle steamer Curlip was constructed in Gippsland, Australia, and launched in November 2008. PS Kookaburra Queen services the Brisbane River, operating as a floating restaurant or venue for hire. PS Enterprise, which was built in Echuca in 1876–78, was used on the Murray River, the Darling River and the Murrumbidgee River in New South Wales. She was acquired by the National Museum of Australia in 1984, restored to full working order, and is now berthed as an exhibit outside the Museum at a wharf on the Acton Peninsula, Lake Burley Griffin, Canberra. PS Marion, based at Mannum. The paddle wheeler Nepean Belle operates cruises on the Nepean River at Penrith, New South Wales. The restored paddle steamer Waimarie is based in Wanganui, New Zealand. Waimarie was built in kitset form in Poplar, London in 1899, and originally operated on the Whanganui River under the name Aotea. Later renamed, she remained in service until 1949. She sank at her moorings in 1952, and remained in the mud until raised by volunteers and restored to begin operations again in 2000. The 1907 Otunui Paddleboat operated on the Whanganui River until the 1940s in her original form as a tunnel screw riverboat. Lost from her mooring in a flood she was refloated in the late 1960s and rebuilt as a sternwheeled jetboat. Around 1982 she went overland to Lake Okataina and was converted to the sidepaddle vessel as she is today. Currently operating on the Wairoa River at Tauranga, this 17 m (56 ft), diesel powered vessel with hydraulic drive for the paddlewheels offers scenic cruises and charters. Kapitein Kok is a paddle steamer built in 1911 for ferry service on the river Lek. It was fully restored in 1976 and is still in use today[when?] as a party ship. Queen Beatrix chartered the ship in 1998 as part of her 60th birthday celebrations. The paddle steamer De Majesteit was built in 1926. In 1958, a part of the movie G.I. Blues featuring Elvis Presley was shot on board of this ship. Michigan is a paddle wheeler built in 1982, for cruising on the Lake Biwa at Shiga. The name is from Michigan, a sister region of Shiga. Portland is a preserved steam-powered sternwheel tug based in Portland, Oregon, that is listed on the U.S. National Register of Historic Places. The British Admiralty's Royal Maritime Auxiliary Service constructed a new "Director" class of diesel-electric paddle tugs as recently as 1957 and 1958. Each paddle wheel was driven by an individual electric motor, giving outstanding maneuverability. Paddle tugs were able to more easily make use of the inherent advantage of side wheel paddle propulsion, having the option to disconnect the clutches that connected the paddle drive shafts as one. This enabled them to turn one paddle ahead and one astern to turn and maneuver quickly. ^ Experience of economics: The paddle designs using diesels are tourist vessels servicing sightseeing attractions or replica riverboats and are mainly restaurants and casinos. ^ The namesake of Shreveport, Louisiana..
^ Vessels operating on the Mississippi River system are referred to as "boats". ^ As a sampling: Steamers operate on Lake Champlain, Lake George, and Lake Winnipesaukee in the U.S. Northeast as of 2019. ^ Evers, Henry (1875). Steam and the Steam Engine: Land and Marin. Glasgow: William Collins, Sons. ^ Hall, Bert S. (1979). The Technological Illustrations of the So-Called "Anonymous of the Hussite Wars". Codex Latinus Monacensis 197, Part 1. Wiesbaden: Dr. Ludwig Reichert Verlag. p. 80. ISBN 3-920153-93-6. ^ a b White, Jr., Lynn (1962). Medieval Technology and Social Change. Oxford: At the Clarendon Press. p. 114. ^ "Musée national de la Marine: Pyroscaphe. Bateau à vapeur". Archived from the original on 2009-11-18. Retrieved 2012-07-29. ^ "Steam-boat on a new construction". The Monitor. Sydney, NSW. 21 May 1828. ^ Viegas, Jennifer (2010-08-24). "When Horses Walked on Water to Transport Humans". Discovery News. Retrieved 2014-04-17. ^ Paine, Lincoln P (1997). Ships of the World. Houghton-Mifflin. pp. 182, 350, 357, 433–434, 487. ISBN 0-395-71556-3. ^ "Steamboat navigation". Mississippi River Navigation. US Army Corps of Engineers Team New Orleans. Archived from the original on 2010-01-29. Retrieved 25 Feb 2013. ^ Ewen, William H (1988). Days of the Steamboats. Mystic Seaport Museum, Inc. pp. 27, 53, 70–71. ISBN 0-913372-47-1. ^ Gandy, Joan W; Gandy, Thomas H (1987). The Mississippi Steamboat Era in Historic Photographs. Dover Publications, Inc. pp. 2–3, 116. ISBN 0-486-25260-4. ^ Needham, Joseph (1986). Science and Civilization in China: Volume 4, Part 3, Civil Engineering and Nautics. Taipei: Caves Books. p. 31. ^ Needham, Joseph (1986). Science and Civilization in China: Volume 5, Part 7, Military Technology; The Gunpowder Epic. Taipei: Caves Books. pp. 165–166. ^ "USS Miami Civil War Union Navy". ^ "About the Belle of Louisville," Belle of Louisville Web site (http://www.belleoflouisville.org/about-the-belle-of-louisville.html). Retrieved July 26, 2014. ^ Know Your Ships 2017. Marine Publishing Co. Inc. 2017. p. 41. ISBN 978-1-891849-22-0. ^ "Sächsische Dampfschiffahrt". Sächsische Dampfschiffahrt. ^ "Seenschifffahrt Ammersee". Website of Seenschifffahrt Ammersee. ^ "Chiemsee Schiffahrt". Website of Chiemsee Schiffahrt (German). ^ "Website of Trivapor Society". ^ "Paddle Steamer Monarch Wareham". Wareham Steam Navigation. ^ "Paddlesteamer Kingswear Castle returns home to the Dart after 50 years". Torquay Herald Express. ^ "Russian river ships (in English)". Archived from the original on 2007-03-01. ^ Paddle steamers back on River Murray for largest gathering in more than 50 years The Advertiser, 2 September 2012. Accessed 5 September 2014. ^ "Our Paddlesteamers – PS Pevensey". Echuca Paddlesteamers. Archived from the original on 2013-04-10. Retrieved 2013-02-13. ^ "Our Paddlesteamers – PS Alexander Arbuthnot". Echuca Paddlesteamers. Retrieved 2013-02-13. ^ "Murray River Paddlesteamers : Cruising along the Murray River". ^ "Murray River Paddlesteamers : P.S. Emmylou". ^ "PS Melbourne & PV Rothbury". ^ "Paddle Steamer Enterprise". Retrieved 2016-10-23. ^ "Whanganui River Boat Centre". Archived from the original on 2007-07-31. ^ "National Register of Historic Places Registration Form: Portland, Steam Tug" (PDF). National Park Service. February 15, 1997. Retrieved January 17, 2015. ^ Desmond, Kevin. "Electric Boats and Ships: A History". Clark, John and Wardle, David (2003). PS Enterprise. Canberra: National Museum of Australia. Dumpleton, Bernard, "The Story of the Paddle Steamer", Melksham, 2002. Wikimedia Commons has media related to Paddle steamers.